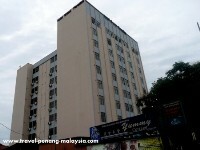 If you are looking for Hotels near KOMTAR in Georgetown, Pulau Pinang, below you will find details of the hotels in this area that are within 5 - 10 minutes walking distance of KOMTAR. Kompleks Tun Abdul Razak (KOMTAR for short) is Pulau Pinang's tallest building and is part of a large complex of administrative offices, retail outlets, shopping malls (Prangin and 1st Avenue) and has the islands main local transportation hub just underneath, where you can catch buses to anywhere around the island, or luxury coaches to distant destinations. For more details on these hotels, guest reviews and to compare room prices, just click on the hotels name below. This brand new hotel near KOMTAR (opened in 2018) is located on the corner of Jalan Magazine and Jalan Gurdwara, just across the road from the KOMTAR building and Gama Supermarket & Departmental Store. A deluxe business class hotel, the Hotel Jen is the closest accommodation to KOMTAR being located just a few minutes walk from the main shopping centres along Magazine Road. Accommodation at the Jen come in a range of sizes from the 28 sqm Deluxe Rooms to 32 sqm Family Rooms with a sofa bed, 60 sqm Apartment Rooms and 52 - 78 sqm Suites. All guest accommodations come with a mini fridge, electronic safe, writing desk, TV with satellite / cable channels, IDD telephone, tea and coffee making facilities and 24 hour room service. Guests staying in the Apartment Rooms, Club Rooms and Suites also get the added benefits of access to the hotels Club Lounge, where you can enjoy free snacks and beverages all day long and free beer, wine and spirits in the evenings. The property features an on-site restaurant, café, bar and lobby lounge, an outdoor swimming pool, health club, gym, sauna, steam bath, massage treatments, meeting / function rooms and free WiFi in all rooms and public areas. A new 4 star hotel in George Town opened in April 2015, the St Giles Penang - The Wembley Premier Hotel is a newly built deluxe accommodation in George Town, located on Magazine Road, very close to the KOMTAR building, just across the road from the Hotel Jen (formally the Traders Hotel). The St Giles Penang has a total of 415 guest rooms with a choice of Superior or Deluxe rooms as well as an Executive Floor where guests can enjoy the private lounge for breakfast or evening drinks. Superior rooms come with either two single beds or one king sized bed. Deluxe rooms come with one king sized bed. All rooms are individually air-conditioned and come with free tea / coffee making facilities, IDD telephone, hair dryer, iron / ironing board, in-room safe, TV with satellite and movie channels, mini fridge and free broadband internet access. On the 11th floor, guests can enjoy the city views while taking a dip in the hotels salt water swimming pool or work out in the gym. 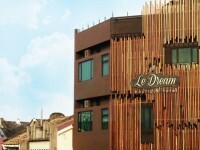 The hotel offers a Café, Brasserie and lobby lounge. A highly rated small boutique hotel located along Noordin Street in a restored 1920's shophouse (just down the road from the Cititel Express) and just a short walk away from the 1st Avenue shopping mall and KOMTAR. Accommodation at this small heritage hotel in Georgetown consist of traditional 1950's Shanghai style Mews Rooms and larger Suites ideal for families. Facilities at the Nordin Mews Penang include and outdoor pool, all day café, a library, common area and small garden. This highly rated small boutique bed and breakfast hotel is located towards the end of Lebuh Pantai (Beach Street) and is less than 10 minutes walk away from Prangin Mall and KOMTAR. It is also in a good location for exploring the city, close to the tourist attractions, with the main street art areas just 5 minutes walk down the road. This small hotel has only a handful of tastefully designed rooms, with four Hideaway Rooms and one Hideaway Suite, housed in two beautifully restored former shophouses and built around two inner courtyards, it is an ideal place to escape from the crowds. A fairly new boutique Heritage hotel in Georgetown opened in 2015, with an excellent location for exploring the city, situated at the end of Penang Road on the junction with Burma Road, next to the pedestrian bridge that crosses over the junction to KOMTAR and all the shopping malls. The hotels small number of rooms come in the form of either Deluxe Twin or Deluxe King and have an chic industrial, exposed brick, designer style with all the mod cons. This former row of shophouses has been lovingly restored, offering unique retro-designed accommodation, an on-site restaurant and cafe. This new Suites hotel in Georgetown, Penang, opened towards the end of 2017, is located along Jalan Magazine, just across the road from KOMTAR, next to the St. Giles Wembley Hotel. The 23 storey property offers a total of 96 Executive Suites, in 6 different varieties, designed with for people on business trips, but equally good for leisure travellers who would like extra space compared to a normal hotel room. All Suites are individually air-conditioned and come with complimentary high-speed internet, two TV's with satellite channels, microwave, kettle and an in-room safe. Facilities at the property include an on-site restaurant and bar, Gym, Function Rooms and a Business Centre. Opened in late 2015, this highly rated new boutique hotel in Georgetown offers a good location on Rope Walk (Jalan Pintal Tali), just a few minutes walk away from KOMTAR and all the shopping malls, as well as being close to many of the tourist attractions of the old part of the city. Guest accommodation at this small boutique hotel come in the form of Standard and Superior Rooms with either Twin beds or one King sized bed, Deluxe King or Deluxe Quad family rooms sleeping four people. The property features an on-site restaurant, sky bar (with free drinks for guests) and gym. A new 3 star hotel opened in April 2015 located on Noordin Street, just a few minutes walk away from KOMTAR and all the shopping malls in this area of the city. This new good value, affordable Penang hotel was opened in April 2015, and is connected by a corridor to its sister hotel, the 4 star St Giles, The Wembley Hotel, which is located along Jalan Magazine, directly opposite the 1st Avenue, Prangin and KOMTAR malls. The Cititel Express Hotel in George Town Penang offers a total of 234 guest rooms, from the small and cozy, Standard Rooms with either a Queen sized or twin beds, Superior Rooms with twin beds or larger Family Rooms with one Queen sized and two single beds. All guest rooms are individually air-conditioned and come with free broadband internet access. In-room you will find a digital safe, flat screen TV with movie channels, mini fridge, hair dryer and IDD telephone. Bathrooms come with rain-head showers. The hotel has an in house restaurant, the Enoshima Japanese Restaurant, located on the lobby level, which is open for breakfast, lunch and dinner. A deluxe hotel located within walking distance of KOMTAR, the 4 star Sunway Hotel Penang is located within Georgetown's bustling shopping and government districts, on a small road, New Lane (Lorong Baru), that leads off of the busy Macalister Road. In this area of the city you are surrounded by restaurants and hawker food courts and with the KOMTAR building, Prangin Mall and 1st Avenue Mall, all within walking distance of the property, this area is a shopping paradise. It is also near the Times Square shopping mall, which can be reached by foot in just a couple of minutes. 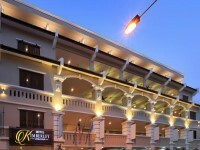 The Sunway Hotel George Town Penang offers a total 241 rooms from deluxe rooms to suites. 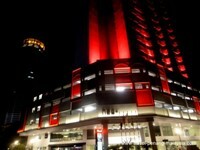 Deluxe Rooms and Deluxe Club Rooms (on higher floors) are a spacious 28 Sqm, while the larger Executive Rooms are 32 Sqm. Suites have a separate living, working and sleeping area and are much larger at 56 Sqm. All rooms are individually air-conditioned and offer complimentary drinking water, free local newspaper (daily), IDD telephone, LCD TV, electronic safe, coffee & tea making facilities, writing desk, sofa and a coffee table. Guests can choose from either one King sized bed or two Twin beds. 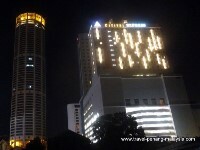 A 3 star hotel located along Jalan Gurdwara just a 5 -10 minute walk away from Jalan Magazine and the KOMTAR buildings, the 3 star Neo Hotel Penang, is a relatively new accommodation in George Town, opened in February 2015, in the building that used to contain the Grand Continental Hotel. The building has undergone a complete refurbishment and now the NEO+ Hotel, offers guests a new modern, chic accommodation, close to the central shopping area of the city around KOMTAR and given generally good reviews by previous guest at Tripadvisor. Standard Rooms are 21 Sqm and available with either a Queen sized bed or two twin beds. Superior Rooms are slightly larger at 28 to 30 Sqm and come with a Queen sized bed. Family Rooms are 36 Sqm and come with one Queen bed and a Single bed. Suite Rooms are 38 Sqm and come with a Queen sized bed. Air-conditioning, safety deposit box, large LED TV, IDD phone, mini bar, tea & coffee making facilities, bathroom with shower, hair dryer. Wireless internet access is available in all rooms as well as all public areas of the hotel. This property comes with a rooftop swimming pool, as well as a gym, an in-house Cafe as well as the Lemongrass Restaurant. 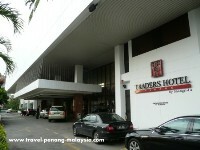 The 3 star Glow Hotel Penang by Zinc offers guests to the city a good location along the busy Macalister Road, just a short distance away from the main shopping malls in the centre of town. 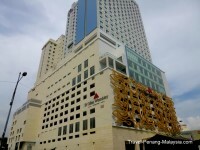 This property was previously called the Grand Paradise Hotel, but has been taken over by the Zinc brand and is their first Glow Hotel in Malaysia. 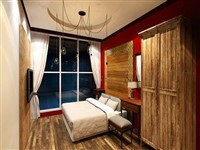 The Glow Hotel Penang has a range of room types to suit both the single, couples or a family group. - Superior Double (Queen) or Twin Beds. - Family Triple - 1 Queen sized bed and 1 Single. - Family Quad - 1 Queen and Twin Beds. All rooms are individually air-conditioned and come with luxury beds and pillows, LCD TV with satellite channels, IDD Telephone, In-Room Safe, Tea and Coffee making facilities and all rooms offer free High-speed Internet. The Glow Hotel has fitness centre with a swimming pool. ZEST Bar Café is the place to go for your complimentary breakfast or enjoy an ala carte lunch or dinner. There is also a lobby bar and pool bar to enjoy a drink. 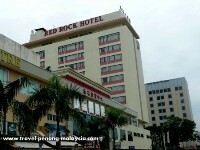 A popular 3 star accommodation, the Red Rock Hotel Penang is located along the busy Macalister Road which runs down to the tallest building on the island, KOMTAR and the Prangin and 1st Avenue shopping malls. The hotel offers a total of 127 varied room types, starting from standard rooms to more exclusive executive suites. The property features an on-site restaurant, Pub and Karaoke, outdoor swimming pool with an adjoining shallow pool for children, a pool bar, massage services, banquet and conference rooms. 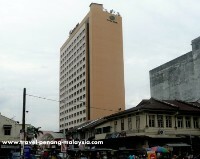 The 3 star Hotel Sentral Penang is located along Lorong Kinta just off of Macalister Road and close to the central shopping area of KOMTAR in George Town. For those of you looking for a new modern hotel in Penang close to the city's shopping area, this property might be for you, as it is a nice, recently built, clean accommodation, with a good location right in the centre of the city. The hotel offers a total of 137 rooms, all with modern decoration and in-room facilities, such as a mini fridge, tea and coffee making facilities, a room safe, LCD flat-screen TV's with Astro channels. The rooms also come equipped with free WIFI internet. The hotel Sentral has the Nu Orient Coffee House which serves both international and local food for breakfast, lunch and dinner. Also along Larong Kinta is the 2 star Heliconia Hotel Penang, which offers good clean affordable accommodation in a ultra modern building, right next to the much larger Hotel Sentral, located towards the end of Lorong Kinta where it joins the busy Macalister Road, with all its restaurants and hawker food outlets. The HelicoNia Hotel in Georgetown, offers a no-frills range of guest rooms that are modern in design, clean and come at very affordable rates. All rooms are air-conditioned and come with an in-room safe, flat screen TV, tea and coffee making facilities and wireless internet access. A new 3 Star heritage hotel near KOMTAR opened in early 2016 located just across the road along Jalan Sungai Ujong. This fully renovated pre-war building now offers visitors a total of 116 affordable guest accommodations over 4 floors. Good value rooms start with the 12.5 sqm Standard Rooms and 14.5 sqm Deluxe Rooms. There is also a choice of larger, more luxurious Suites, ranging from the 19.5 sqm Oriental Suites to 30.5 sqm Family Suites sleeping 4 people. The hotel offer an all day restaurant and two function halls. There are a number of cheaper budget accommodation options that are just a few minutes walk from the KOMTAR building in George Town. Please click on the link to read reviews and compare prices for booking online (where available) from the Tripadvisor website.